Though superb works of art in themselves, the wildlife paintings of Francis Barlow are full of rich metaphors that shed light on the anxieties and concerns of a Britain emerging from the horrors of civil war, says Nathan Flis. 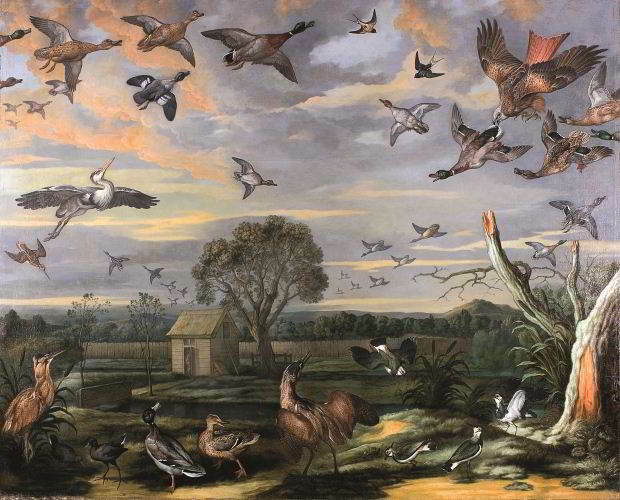 Francis Barlow (c. 1626-1704) was England’s first wildlife painter and ranks among the most prolific book illustrators and printmakers of the 17th century. The work for which he is most often remembered is his extraordinarily lavish edition of Aesop’s Fables (1666); but in the years leading up to the Glorious Revolution of 1688-89 Barlow was also the prime designer of political satire in support of the Whigs. A new exhibition at Clandon Park, a National Trust property near Guildford, re-ignites interest in this surprisingly neglected artist. Clandon houses six of Barlow’s paintings, one of the largest collections of his work. They were acquired or commissioned by Denzil Onslow (c. 1642-1721), Whig MP for Surrey, to decorate his manor house, Pyrford Court. Each painting can be decoded in the context of Barlow’s prints and drawings across several genres: natural history; hunting and recreation; politics; and decoration and design.